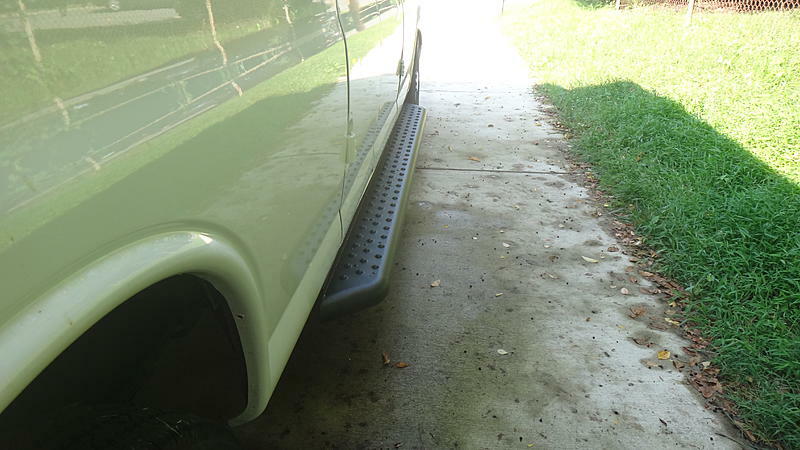 Now that I'm on the right computer, here's a pic of the running boards. Yes they do. I have the long wheelbase, and they fit fine. Edit; I just hit the app guide, and they don't show the long wheelbase will fit. But they also stop at '14, and I have a '16. I got them through CarID. They were $415.45 ($69.21 S&H). I just went through the process with '06, and they say it fits the "regular" van, and the boards are 100" long. I just went and measured mine, and they're 100" long. I just guess we're "regular"
would work ... may need an adapter ???? Yes, but the passenger side does show it going just past the rear side door. I was in a hurry when I took those. I hope to get some more next week. I just moved, and promised Da Wife I'd work on getting the house straight, through Sunday. 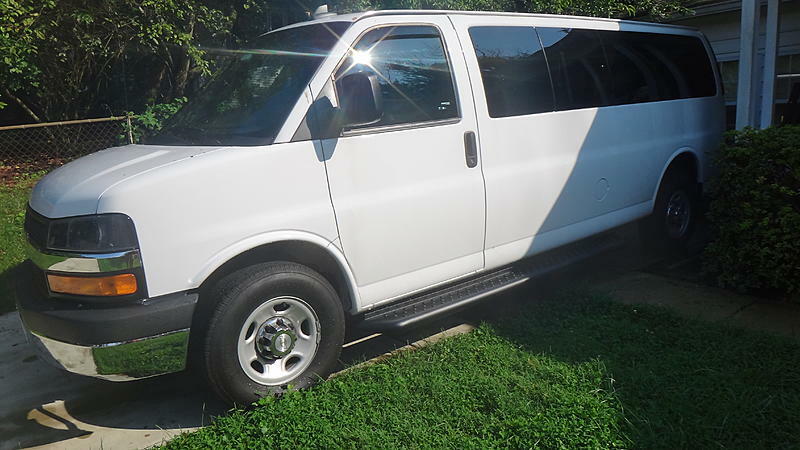 But I have my first camp trip in this van in 2 weeks, and need to build the bed, and install the stereo. I hope to document the whole thing. It won't be finished by the trip, but it will be usable. That antenna is for the OnStar and XM/Sirius. Way different frequencies. I have the standard 31" FM antenna on the right fender. As a Ham radio guy, I would tell you that is the best antenna for FM. If your new radio is XM/Sirius, that roof one would work, but I'd bet it's not cheap. adding that style of antenna I am how ever curious,. you will need an adapter to use that antenna ? No problem. I don't think the OnStar terminates at the radio, but the XM/Sirius should, and it seems to me that this antenna is actually two antennae in one housing. If my plan is on schedule, the radio thing should be Tuesday. A warning; if you decide to do this antenna, be careful if you have the side curtain air bags. I don't know if your '06 has them, but my '16 does, and I'm hesitant to mess with the headliner because of it. I used to do accessory installations professionally, back in the day, before air bags. I won't feel good about installing the hands free mic for my new radio, but I think I'll be okay if I just stay away from the sides. And I certainly won't be dropping the headliner. That's one of the reasons I won't be putting a Ham radio antenna on the roof. Truthfully, I don't know what I'm gonna do about that.